This is not my first Linden novel, nor will it be my last, but bring on the secrets and the spindly web tales! 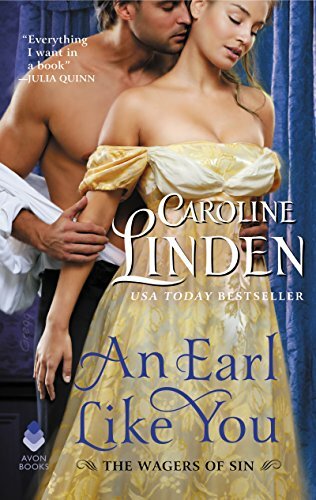 Linden has always been an author who writes historical romance with a hint and tease of mystery. For rabid readers, think the dark, angsty back stories and crazy tales a la Anna Campbell, even Sarah Maclean. Linden skirts the edge though, she doesn’t go as dark as other authors do, but she weaves a powerful plot with many threads. This book is no exception. The hero, Hugh, an earl who finds himself in desperate need of money gets involved with a man who refuses to take no for an answer. The lack of no, leaves Hugh courting a woman he doesn’t want in the hopes of saving his families fortune. Hugh is such a gentleman and reminds me of a haughty snob, who doesn’t know how to not be kind and solicitous to our heroine. I really fell for the hero (he hit all my swoon buttons) and as the book continued I found his possibilities for redemption getting smaller and smaller. This hero is swoon worthy because of his defense for the heroine, his acceptance of an attraction to her he can’t evade, and how he’s victim of the ‘best laid plans’ approach. Eliza, short for Elizabeth, our heroine, is ultimately without a laundry list of flaws. In a way, she’s almost too perfect, outside of her selfishly wanting to believe that the earl is interested in her for her. That said, she is likeable from a relatable standpoint. She’s a female Richie Rich, with money instead of chores, but is looked down on for her riches and how they were earned. Her biggest trouble is she wants to be loved and when handsome Hugh shows up, she falls for the bait. It was easy to root for Eliza and Hugh, both suffering from their circumstances in their own way, but both deserving to have someone that appreciates them in their life. As for external details, I loved the villain of the piece. Made more believable because this villain is sincere and unrepentant in his actions. He truly believes he’s doing the right thing even if his actions have a negative effect on others. There is an additional side-tale involving Hugh’s sister and I pray she gets a happily ever after story of her own at some point. Overall, this book was a nice treat. It sucked me in fast and works perfect as a nice gateway to those new to Linden’s writing. Recommended for folks who enjoy Valerie Bowman.